Yesterday, as we paused to remember Dr. Martin Luther King, Jr., I heard anew one of his famous calls to action. "Life's most persistent and urgent question," Dr. King challenged us, "is what are you doing for others?" Sargent Shriver, who passed away today at the grand age of 95, was the living embodiment of a man who responded to that call with nearly every fiber of his being. His life was a full and magnanimous one spent enthusiastically in the service of others. It was Sarge who founded the Peace Corps at a time when others were skeptical of U.S. motivations abroad. It was Sarge who led the war on poverty at a time when the poor were a forgotten "other America." It was Sarge who, with his dear wife of 56 years Eunice, spent decades fighting for the rights and abilities of people with intellectual disabilities. He spent his life fighting intensely for those who needed it most. Sarge was a national treasure, but he was also a dear friend. 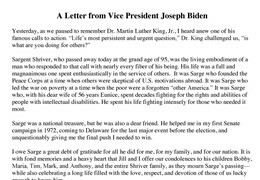 He helped me in my first Senate campaign in 1972, coming to Delaware for the last major event before the election, and unquestionably giving me the final push I needed to win.I owe Sarge a great debt of gratitude for all he did for me, for my family, and for our nation. 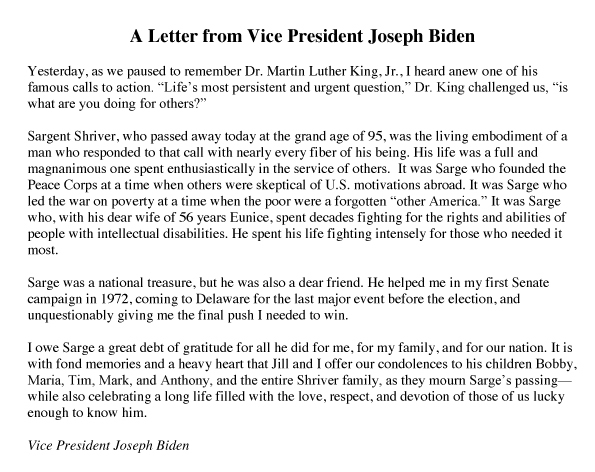 It is with fond memories and a heavy heart that Jill and I offer our condolences to his children Bobby, Maria, Tim, Mark, and Anthony, and the entire Shriver family, as they mourn Sarge's passing -- while also celebrating a long life filled with the love, respect, and devotion of those of us lucky enough to know him.